share how the work has improved their life and well being! benefits of each. Just today I had lunch and savored being at an upscale local eatery. “me time” each week – something outside of the ordinary. This alone is for sure going to amp up my vibe. my coaching practice with passion, and not the mlm path. I am so excited, and look forward to another session prior to the end of the month. focus on releasing perfectionism and worry. Thanks for your service and commitment! about my mom’s lung cancer I wanted to share this with you. When my mom was diagnosed, the doctors figured she wouldn’t survive. didn’t do treatment, and they expected only months with treatment. She went through the chemo anyway, and decided she wanted to live. since all of my immediate family on her side have died of lung disease. before they could even complete the proscribed treatment! wanted to share her miraculous recovery with you! Everything just keeps getting better and better! the ease and grace of the Divine. Thank you Dakara for all you do for me, for so many and for the planet! me from me, I wanted out of my misery of struggling with life. I just felt like ME. to force myself to even come up with the negative thoughts. Now I feel like I can go into the world and BE genuinely happy. I feel myself growing in leaps and bounds instead of baby steps. Now I honor myself and who I am and it feels great. profound difference in my life. gentle and loving in her assistance. Her chants are moving and sacred. powerful guides that are here to work with me. what was necessary for my moving forward and removing blocks. I am so grateful for our time together and the healing that I received. to receive this session today after hearing back on the lease. other wonderful things as moments progress and energy integrates! work with you and who have assisted me in the sessions with you! relationship with my husband. I’m very grateful for finding you. Please keep sharing your gifts with the world. Thank you Monica for sharing your heart! 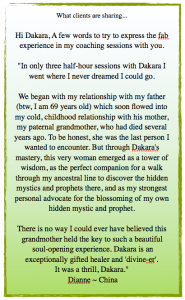 “Dakara is a gifted Master Spiritual Healer! she is able to have fun during the session as well. and how I connect to my Source, my Heavenly Father. away of pain in order to usher in the light. I am truly grateful. my paternal grandmother, who had died several years ago. To be honest, she was the last person I wanted to encounter. DaKara is an exceptionally gifted healer and ‘divine-er’. of the package whenever I need support with any of my issues. my lower back.I always carry a lot of pain in my neck also. used Heart Point Technique to help shift the energy behind the pain. allowed me to accept the healing that was taking place. own power and self worth again. Thank you Dakara! into my personal power, both in this world and in the spiritual world. I have stepped into my role as a healer and shaman. I finally own and accept being a Shaman as part of my life purpose. struggling with finding a job which also affected my self confidence. in day to day living. I have also attended several of DaKara’s teleclasses and workshops. I have found working in groups to be richly rewarding. one session, amazing and profound change happens with her work. wanted to pay me and she was so pleased. more soon. I will connect with you soon. was awesome! You are truly a gifted healer. accomplish what I need to get done. the help and support that I need to complete my tasks. held the key to such a beautiful soul-opening experience. of the gifts that the universe is sending me.